Being a female rider I do hear of occasions where girls seem to get a raw deal when trying to learn to ride, but this one I heard about today just about takes the biscuit as far as I’m concerned! A 25 year old girl wants to learn to ride, has a bike already and is busting to get out on the road on it, so she rings an instructor and tells him she wants to take her CBT. She says she wants to do it on his bike (hers isn’t taxed or anything yet) and also advises that she is 5 foot tall. After reassurance that this wont be a problem she books the CBT. So she turns up a few days ago, undoubtably a bit excited about learning to ride, and goes through the two and a half hours of indoor classes covering theory, safety and bike controls. All well and good so far, yes? He then went on to tell her that she will never ride anything other than a cruiser, but can’t so her CBT on one because of the larger turning circle needed by cruisers. Also she should sell her bike and give up. In addition, he repeatedly told her that if she rode the bike she owned she would crash it, and probably die!!! According to this particular instructor “the law” states she has to be able to touch both feet flat on the floor and if she couldn’t she wouldn’t be able to take a test plus would be laughed off the training ground! He also told her husband the same thing when he rang up later to find out what had happened. To top it all off, she paid for a FULL CBT lesson and test and now the instructor is refusing the refund any of the money!!!!!!!!! I simply cannot believe he has behaved in such a way towards a paying customer and as for saying “the law” says you can’t ride a bike unless both feet are on the floor.. It’s a load of b******s!!! Both myself and several other girls have advised her to report the instructor and to demand a refund. I hope she does and many such incidents go unreported and unless the DSA is aware they are unable to do anything to prevent such occurances happening again! ooooo… it’s enough to make my blood boil!!!!!!! There are so many things to consider, beyond price, when choosing your first ‘big’ motorbike after passing your test, and I thought the easiest way to do this was to write this from my personal point of view as a female rider. If there are other ladies out there facing the same dilemma then maybe, just maybe, reading about the things I had to consider may help you in your choice of motorcycle. I will try and briefly list the points I had to consider when choosing my bike. Things like the physical size of the bike, its engine size, and the fact I had a restricted license so had to consider how a restrictor kit would affect my choice of bike. What the seat height was, how wide it was and how much of my feet would be on the ground when at a standstill. Where the centre of gravity of the bike was and how balanced I would feel on it. And lastly what type of bike to buy and how old a machine I would get. The first thing I considered was the seat height of the bike. I’m 5 foot 3 inches tall with an inside leg measurement, wearing my bike boots, of 32 inches (odd proportions as over half my height is legs!) and I’m about the 8 stone mark so I’m not exactly well built! The physical size of the bike was as far as I was concerned rather an important issue. I had learned on a cruiser style 125cc and after riding that and being so low to the ground I was convinced, when choosing my next bike, that I would be happier being able to get all of both feet on the ground. So I was looking out for a bike which wasn’t too tall. Being able to get all of both feet on the ground isn’t necessary. Some people aren’t bothered by it, while others are. I just found it made me feel that little bit more confident, especially when moving the bike around with the engine switched off, for example getting it in or out of the garage. Don’t forget you can lower a bike if your heart is set on it. Check out my posts on Ride Height Adjuster Kits to see what your options are in that respect. The width of the seat and bike can be an issue as well. If the bike is wide then obviously your legs will be further apart when sitting on it. Sorry ladies but it is true! You may find that sitting on a wide bike will have you on tiptoes where as a narrow bike of similar height will enable you to flat foot. This was rather important to me as well, being small and slim. I didn’t want to have a bike I would need help moving around, it would be very annoying (and possibly a tad embarrassing!) if I needed help moving it round all the time! Once you are used to riding a larger bike the weight will become less of an issue, as it has with me. How low or high the bikes centre of gravity is may be an issue. With a lower centre of gravity the bike may feel more stable for you. Where as one with a high centre of gravity can feel top heavy. When I first sat on the GSX-R750 I realised how high its centre of gravity was and was afraid if I leant it over the weight might catch me by surprise and I would drop it, and that wouldn’t be a good thing to do! As I have previously mentioned on this blog I passed the UK restricted motorbike test on a 125cc bike. This basically means that I am restricted for two years from the date of my test as to what output any motorcycle I ride can have. Any bike I buy must have a power output of less than 33bhp, or be restricted to that by other means. So when looking for a bike I checked the list of ones with power less than 33bhp and decided I didn’t want any of them! So the next step was to check which bikes could have a restrictor kit fitted so they were under the 33bhp. I soon found that there are loads of bikes which can be restricted! So there were plenty I could choose from, but when you consider my previous points the field was narrowed down again. I had to choose a bike that would take the restriction happily, after all what’s the point of buying a small, light, narrow 1000cc bike and then restricting it? None as far as I could see! So a bike with a 400cc-600cc engine seemed the way to go, the choice of which model depended on all the rest of the issues I have already mentioned. As much as I would have loved to ride out of a dealer on a brand new bike I decided that this was really something I didn’t want to do. My first big bike was going to be the one I carried on learning on, the learning curve just doesn’t stop once you have passed your test! Chances are you will at some point drop your bike, and which would you swear about more. 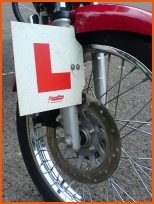 The brand new bike you have just bought or the 15-year-old one which already has a few dings? I would really swear at both but, in all honesty, if it was a new bike the swearing would be more profane and a whole lot louder! Me? I went for the older bike..
Cruiser, Tourer, Dual-Sport, Commuter, Sports? This seriously comes down to personal choice. I personally love the sports bikes (and the old Z650’s) but my new baby had to be a sports bike. The best advice I can give is to go to as many bike dealers as possible, see what sorts of bikes ‘float your boat’ and make sure you sit on as many as possible until you find the one which feels just right. Following advice from my nearest and dearest I settled on the Honda CBR400RR. Easy to restrict to 33bhp, small enough that I can reach the ground very easily, light enough that I can move her around and a low center of gravity which means she corners like she is on rails. Am I happy with her, and my choice, after almost a year? You may also want to take a look at these posts which contain more advice and tips. Buying the correct size crash helmet is probably the most important thing you will need to do if you are either just learning to ride, or replacing a crash helmet which has been damaged in some way. A correctly fitting crash helmet really can save your life and really is something you should spend some time doing to ensure a perfect fit. Here is a quick guide to help ensure you buy the correct size. Firstly use a tape measure to find out the circumference of your head. Measure round your head with the tape just above your ears and about one inch, or 2.54cm, above your eyebrows. Don’t pull the tape too tight, but take your time and measure your head a few times and work out the average measurement. When you have your head measurement look at the size guide below to find out your helmet size. If you find your head measurement is between two sizes, you should always try the larger size first. Please note these sizes are intended as a guideline only. The same as when clothes shopping, different crash helmet manufacturers do unfortunately interpret the sizes differently, and so a medium from one manufacturer may not fit as well as the same size from someone else. If you are buying your motorcycle helmet from a retail outlet make sure you try on plenty of helmets from different manufacturers to make sure you get one that fits correctly. If you are buying online, as many people are these days, it is worth remembering that under UK Internet retail law you have the right to return anything you buy for a full refund if you are not happy with it or f it does not ft correctly. You are normally able to return items within 7 days, but make sure you check the small print of the online retailer you are dealing with. Once you have the crash helmet on your head you should always check the following. Next you should try to push your finger up between your forehead and the helmet interior. There should not be any space there for your fingers to fit into. Now you should try to rotate the helmet back and forwards and from left to right on your head. When moving the helmet the skin on your head and face should move. If the helmet moves without doing this it is too big and you will need to try on a smaller size. It’s worth bearing in mind that because of the different sizing by the different manufacturers you may find you are between sizes. If this is the case you may find that you need a different style of motorcycle helmet to ensure the correct fit. Next thing is to fasten the chin strap so that it is tight enough under your jaw, without suffocating you. Once this is done you should try to push the helmet off your head form the back, and then try the same thing from the front. Obviously they should not come off. The last thing to check is that you are totally happy with how much you can see out of the visor. Smaller visor sizes mean you will not see so much as a larger one. If you follow the guidelines you should end up with a crash helmet which is the correct fit for your head. As I mentioned this is one aspect of motorcycling which really can save your life and you should take time to make sure you buy a correctly fitting one. I have found the updated list of the DSA’s new motorcycle test centres and if you click on the sites near you, you will be able to see what the state of play is at your nearest test centre. As you can see from browsing through the list there are going to be huge area’s of the country where learner riders will have to travel quite some distance to their nearest test centre. Stuff doing that! People are going to be nervous enough about taking their test without having to ride for an hour and a half to get to their nearest test centre, like I would have to if I was taking my test after March! In some places the location still shows as ‘site identified! !’ So much for the facilities being in place before March!! If you can get the cash together to do it before March 30th, then I would suggest you go for it and book as soon as possible before the training schools are booked solid again. You are currently browsing the archives for the Learners Lane category.